For a golfer, of course forgiveness means keeping the ball in play on those less-than-perfect strikes that afflict most of us. The TaylorMade Burner Plus irons were designed with maximum forgiveness in mind. If you are a novice golfer, you can’t go wrong with this set of irons. The sweet spot of the clubface is almost as big as the entire clubface. Those of you that have played blades your whole life are not going to know what to do. A shot that is hit off the toe on a blade and dies right into the trees will fly high and land on the right side of the green instead. And a thin shot that kills worms off a blade will fly to the front of the green. TaylorMade is one of my favorite manufactures and makes clubs for everyone from Tour pros to the Saturday morning hacker. Regardless of the players skill level though, with TaylorMade, you'll get a nicely made set with appropriate design features for your game. 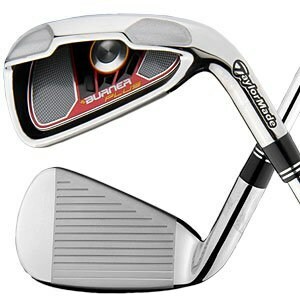 The Burner Plus irons have been created with TaylorMade's "Inverted Cone Technology," designed to increase the Coefficient of Restitution (COR) -- a measure of the energy with which the ball leaves the club face -- over a larger portion of the face itself. When you pick up the Burner Plus irons, you'll notice the heads are pretty good-sized; this allows for wider distribution of weight and advanced perimeter weighting, promoting a lot of forgiveness on those off-center hits mentioned earlier. You'll also note the deep undercut back of the Burner Plus. There is something about these that just look "meaty" -- this is a substantial set of clubs, built with a purpose. Not to be left out, even the sole of the club has a specific purpose in mind: The TaylorMade Multi-Functional sole is a wide, beveled surface, making it easier to get the ball airborne from a variety of lies (good or bad) and to get, and keep, the ball in play. Available in Right hand only, the shaft is steel in Firm flex. If you've ever struggled to hit a blade-style iron, or have been using a 30-year old set of irons, try the Burner Plus irons. By using equipment like the Burner Plus irons, we can hit better shots and simply enjoy the game more. One word of warning, better players will not appreciate the bulk and thickness of these Burner Plus. These irons were built for forgiveness not workability. For you folks, you should take a look at the R9’s and R11’s. These irons are also very forgiving but are slightly thinner and easier to work the ball. And other options to consider in game-improvement clubs include the Callaway X22. And for you beginners I really love Adams A7s. This set includes hybrids which are even more forgiving then these Burners, and way more forgiving than my girlfriend.